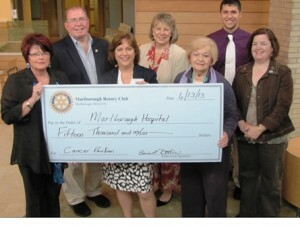 The Marlborough Rotary Club recently donated $15,000 to the Marlborough Hospital Cancer Pavilion. (l to r) Marlborough Hospital interim President and CEO Candra Szymanski; Marlborough Rotary Club President-Elect David Walton; Rotary President Bonnie Doolin; Rotary Immediate Past President Elaine McDonald; Rotary Director Marilyn Perry; Rotaract Club President Monthe Kofos; and Rotary Secretary Peggy Sheldon. Marlborough – In keeping with their motto of “Service above self,” the Marlborough Rotary Club recently donated $15,000 to the Marlborough Hospital Cancer Pavilion. The Cancer Center at Marlborough Hospital? ?” in partnership with the UMass Memorial Health Care Cancer Center of Excellence and the University of Massachusetts Medical School –will house medical oncology and radiation oncology services; highly trained, skilled cancer specialists; and will include a special space for a meditative Healing Garden. The completed center is slated to open later this fall.